The adult sedge warbler (see first picture below) has black and cream stripes on the and a wide distinctive silver-white stripe over the eye known as supercilium (cf. reed warbler which has only a pale eye ring and a thin partial supercilium in front of the eye). It also has an obvious dark eyestripe. It has a buff chest and a white underside and a tawny back with light grey streaking. The rump is unstreaked tawny brown. Ages and sexes are similar in appearance, although juvenile birds (see second picture below) may have some dark spotting on the breast. The song of the sedge warbler is characteristic: its pitch rises and falls in a jerky way - making the song sound very hurried and not at all 'restful' (cf. reed warbler which has a rhythmic, chattering jit-jit-jit with whistles and mimicry). First image above copyright Derek Gallagher under a Creative Commons Attribution-Share Alike 4.0 International license. Second image above copyright bogbumper under a Creative Commons Attribution-Share Alike 3.0 Unported License. 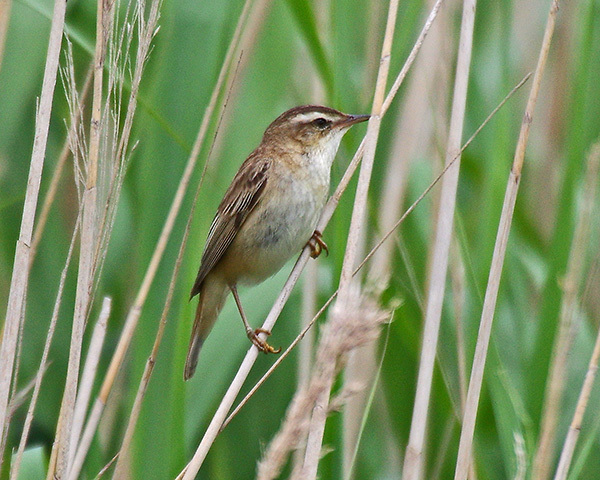 Sedge warblers breed on the edge of wetlands, especially in areas of wet grassland. They are mainly insectivorous, feeding on aphids, dragonflies and damselflies, grasshoppers, lacewings, moths, beetles and flies. Some berries are also taken, including elderberries and blackberries. Prior to migration they may seek out sites that have large numbers of readily captured insects (see below) enabling them to rapidly put on weight before departure. Sedge warblers are migratory, breeding in Europe and temperate western Asia, and wintering in sub-Saharan Africa south to Zambia. 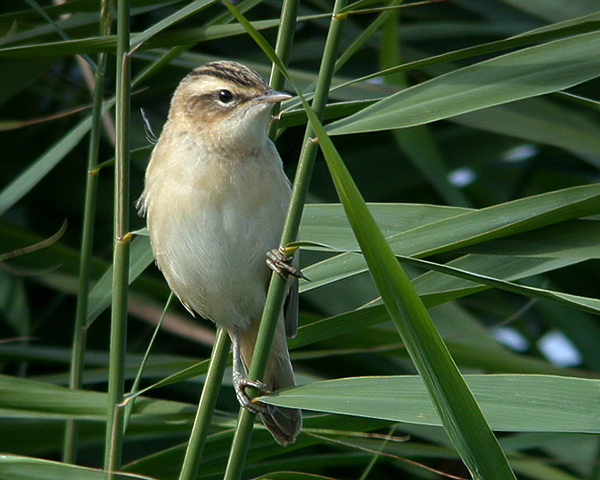 There has been a considerable amount of work done on the feeding ecology of the sedge warbler (Acrocephalus schoenobaenus) as well as on the related reed warbler (Acrocephalus scirpaceus). Bibby et al. (1976) studied the feeding behaviour of sedge warblers in Dorset, UK prior to migration. Available food in the places frequented by the birds consisted almost entirely of the reed aphid (Hyalopterus pruni, also known as the mealy plum aphid, or plum-reed aphid, see picture below), which frequently occurred in hundreds per leaf or per flower. The weight gains of birds feeding on these aphids varied greatly, both amongst individuals and between years. Many of the birds stayed for very short periods. Most left after just two days. Quantifying the number of aphids in their faecal remains was not possible, but aphids were the only insects numerous enough to account for the observed feeding rates. The birds were also found to have eaten small flies and beetles. 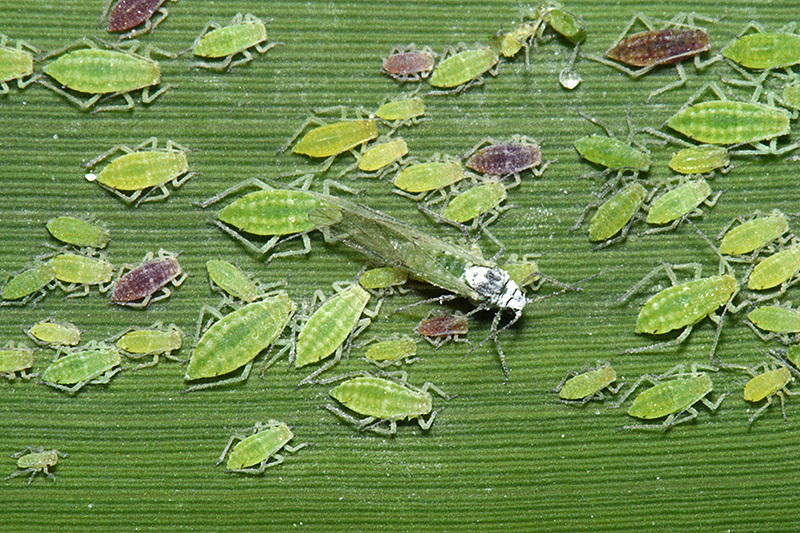 The aphids were most abundant on reeds in wet areas and at a stage before flowering, which led to local patchiness of outbreaks during the autumn. The timing of passage of sedge warblers was broadly correlated with timing of peak abundance of aphids. There was also a correlation between years. Aphids were abundant in 1973, very scarce in 1974 and extremely abundant in 1975, and sedge warblers stayed longer and gained weight faster in the better aphid years. Bibby et al. concluded that plentiful and concentrated food supplies are important for birds depositing pre-migratory fat. Bibby & Green (1981) went on to compare the patterns of migration of Reed and Sedge Warblers, both of which migrate between Britain and Africa, to see how food supply distribution might influence migration. Most sedge warblers fattened in southern England or northern France, and overflew Iberia, while reed warblers paused and fattened in Portugal. The occurrence, duration of stay and rate of weight gain of sedge warblers depended on the abundance of Hyalopterus pruni whose seasonality and distribution was broadly sufficient to predict the migration pattern. Reed Warblers showed no similar restrictions of diet, did not respond to aphid abundance and were able to achieve a similar rate of weight gain any time in September or October in Portugal. It is important to stress that both species of warbler ate a wide range of food items depending on availability. Aphids and mayflies were only taken in quantity in sites where they were abundant. The two bird species were found to have different feeding adaptations. Sedge warblers fed mainly by picking prey at rest on a surface whereas reed warblers used not only this technique, but also took flying insects by jumping at them as they took off. Studies were carried out on the responses of each species to spatial and temporal variations in aphid density. Sedge warblers were found to aggregate in areas with high densities of aphids. Further support for the importance of reed aphids (species not identified) to sedge warblers in late summer/autumn comes from the study of Koskimies & Saurola (1985) on sedge warbler migration strategies in Finland. Image copyright Corine Bliek under a Creative Commons Attribution-Share Alike 3.0 Unported License. Bibby & Green (1983) extended the scope of their studies by looking at the diets and extent of pre-migratory fattening of seven warbler species in autumn at three marshes in western France. The diets overlapped considerably, but there were differences between species of size and taxa of prey taken as well as height of feeding places and of methods used. Sedge and Savi's warblers only gained weight when food in the form of aphids or mayflies was super-abundant. Some reed warblers, including Great reed warblers ((Acrocephalus arundinaceus), were able to gain weight in the absence of such abundant small prey items by virtue, it is suggested, of their more active and versatile feeding methods. Bibby and Green hypothesised that some species can fatten only when there is a super-abundant supply of slow moving or inactive prey, which may be a single arthropod species, while others are more catholic. Chernetsov (1998) working in Lithuania and the Russian Federation showed that the habitat distribution during the post-breeding and post-fledging period of both the reed warbler (Acrocephalus scirpaceus) and sedge warbler (Acrocephalus schoenobaenus) depended on food abundance. During period of post-breeding and post-fledging movements birds, especially juveniles, were strongly associated with patches where their preferred food, Hyalopterus pruni, was most abundant. Both reed and sedge warblers were much more abundant in wet reed beds where more aphids were recorded, although many nests occurred in dry reed. 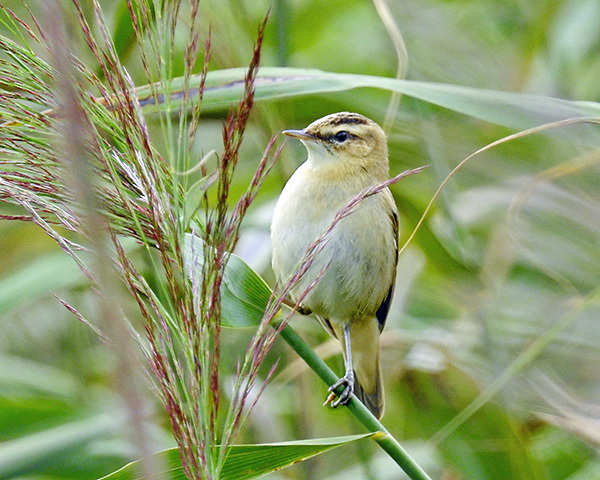 By moving into reed stands from breeding sites in nearby sedge and shrub, the sedge warbler made a more significant shift in habitat selection between the breeding and post-breeding periods than the reed warbler. The association of birds with concentrations of their prey suggests that the purpose of post-breeding and especially post-juvenile movements is to find sites which are most suitable for completing moult and pre-migratory fattening. Chernetsov & Manukyan (1999, 2000) examined the feeding strategies of sedge warblers and reed warblers during spring migration, post-fledging movements, and autumn migration. In spring both species utilised Diptera including chironomids, hemiptera and spiders. In late summer and autumn both species utilised Hyalopterus pruni, chironomids, beetles and spiders. In their conclusions they argued previous studies had overemphasized the difference between the sedge warbler and reed warbler. Bayly (2007) reasoned that the strategies adopted by birds during migration should be strongly influenced by resource availability and the efficiency with which those resources are used. The migratory strategy of the sedge warbler in northwest Europe has been linked to superabundances of Hyalopterus pruni that enable birds to accumulate extensive fat reserves and make nonstop flights to sub-Saharan Africa. Food availability was therefore expected to be the main determinant of whether sedge warblers accumulated extensive reserves or not. In this study, birds were provided with an unlimited supplementary food source. However, only 10 out of 24 birds stayed sufficiently long (mean of 11.6 days) to gain sufficient fuel for a nonstop flight from the U.K. to sub-Saharan Africa. The remaining birds remained for a mean of 3.7 days and accumulated only a limited amount of fuel. It was proposed that the long stay birds had an expectation of decreasing resources whilst short stay birds had an expectation of increasing resources. We know very little about the impact of bird predation on the reed aphid population, although it was discussed by Mook & Wiegers (1999). They noted that Hyalopterus pruni is known to be an important part of the diet of sedge warblers at least in the migration period, and suggested that the stagnation of aphid population growth in June might have been caused by predation in the breeding season of the birds. This was based on the assumption that the reed warbler and, to a lesser extent, the sedge warbler breed until late July and may feed high proportions of aphids to their young. Perhaps the sudden aphid population growth in July coincided with the end of the warbler breeding season and a relaxation of bird predation pressure. But some have argued that bird predation has no impact on the aphid population, since heavy outbreaks of Hyalopterus pruni and damage of reed shoots within the natural monocultures of Phragmites australis continue to occur despite the activities of many species of predators and two species of primary parasitoids (Tscharntke, 1989). For bird identification we have used BTO Bird identification videos for the key characteristics, together with Nord University species comparisons, and the latest Wikipedia account for each species. For aphids we have made provisional identifications from photos of living specimens, along with host plant identity using the keys and species accounts of Blackman & Eastop (1994) and Blackman & Eastop (2006) supplemented with Blackman (1974), Stroyan (1977), Stroyan (1984), Blackman & Eastop (1984), Heie (1980-1995), Dixon & Thieme (2007) and Blackman (2010). We fully acknowledge these authors as the source for the (summarized) taxonomic information we have presented. Any errors in identification or information are ours alone, and we would be very grateful for any corrections. For assistance on the terms used for aphid morphology we suggest the figure provided by Blackman & Eastop (2006).